Isn’t rad how similar they all are? The Fijians are so enthusiastic about greeting you with sincere interest that they often repeat it twice as if one word..”BulaBula!! !” ..which is followed by a hearty hug. I’ve truly never experienced anything quite like this Fijian love of life. Their life, your life, the island life….it is breathtaking. Todd and I were wanting to break out of the comfort zone. We live a life in the city, that although has its urban trials, is by almost every definition pretty comfortable if not posh. All the new technologies are at our feet as beta consumers for the neighboring (world-defining tech firms), an international airport is just out the door and every kind of food you’d ever want to try is in some neighborhood being shared by an immigrant family. When we’ve traveled in these recent years, it’s been to established, “safe” places, often very white. It has been nagging not only on us as parents, but also on us as responsible citizens of the world that there was something missing. Edina’s perspective should not be defined by the swankiest hotel rooms in every destination nor do we want to be defined so superficially. Thus, Fiji. Oh boy howdy rowdy…FIJI! Upon arrival, I must confess that beyond the enthusiasm of the native people to buoy the spirits, I was in a stage of shock. It’s an independent nation of over 300 islands with a population of less than 1M, but the national pride almost defies description. Of course they drive on the “wrong” side of the road and English is a primary language, but they kicked the whites out a long time ago and took it all back. Thank goodness. Sure, that comes with some compromises. I’ll get to that. Everyone here keeps referring to the “mainland”…which I naturally (very obnoxiously) assumed was Australia…NO! Mainland Fiji is their biggest island, the most populated…the New York of Fiji….how cool is that? 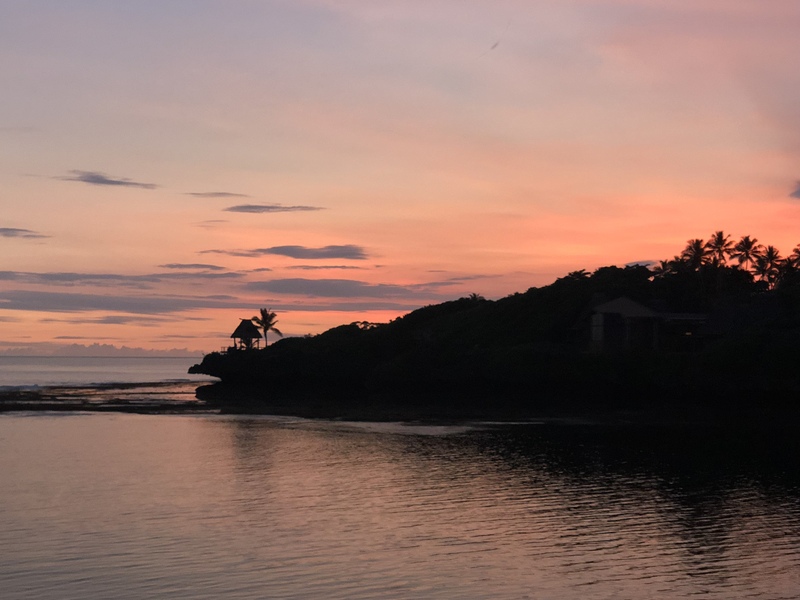 We landed their after our flight from SFO and headed straight to the domestic terminal for a connection up to SavuSavu…where we have spent these initial days of our trip. I’m writing you now from our 2-bedroom bure which is perched on a volcanic outcrop with a view to the south and a blowhole that erupts over two different tide cycles a day. It is raining again at this moment, quite a heavy one, I’m outside by our own little private pool under the “porch” and all is well. But, don’t worry, it will be over in moments and the next glorious part of the day will unfold. Edina immediately rejected the bugs..her perpetually sandy (dirty to her) feet, and perhaps the lack of air conditioning in this tropical environment. I confess, it took some major deep breaths, no closet to unpack in, only an open bar….but the minute I wrapped my head around this as the most luxurious camping we will perhaps ever have the opportunity to enjoy…the magic materialized. This place is magic. We could have packed in backpacks, because clothes don’t matter. Todd’s put on the same shirt for three evenings in a row. We’re hot, consistently a bit damp and having the absolute time of our lives. We sleep under mosquito netting with the screened windows wide open to the elements (yes, two layers of protection)…and listen to every sound the jungle and ocean can provide. Waves, thunderstorms, toads, birds, wind....all behind a dreamy veil of white. It’s the best sleep I’ve had in years (confession, not the first night, but now I’m hooked). I get now why the app providers offer jungle sounds as an option for white noise during sleep. There is also a bizarre time extension on this island. The rusticity and simplicity of it FORCE you to slow down. Wake, coffee, observe the tide, another coffee, sit, watch the clouds, breakfast barefoot, walk the beach, get in a kayak, have an adventure…it’s not yet 9am…and the days unfold in such a mesmerizing series of island experiences that you forget what day it is..
We must walk over to the dining room for dinner in a few minutes, so I must draw this to a close. But, let me also describe why I call this camping and want you to understand how that does not make me a snob. Ma is the director of the property, which is a tiny sub island called Savasi island. It has 9 bures…imagine how quiet and peaceful that makes things. Ma embodies all that you might expect out of the most Fijian boss woman, she pulls you to her bosom, never is without a small and keeps her small staff coordinated and helping you to experience the best of her home. If she’s the camp director, the DJ is our camp counselor. The guy meets us every day at the ready to show us something else about his home island, we take walks with him, we kayak with him, he taught Edina how to paddleboard this afternoon (she stood three times and only fell off once! ), we snorkeled with him this morning in the largest bay in the south pacific where he carved Edina’s name into a log for the island and time to eventually eat up. The two of them together have made this the trip we were hoping for. The journey continues tomorrow as we make our way back to the mainland and a new resort in Nanuka. It’s owned by a hotel group we visit worldwide, Auberge, so I anticipate things being less rustic, perhaps a bit more manicured and polished, which I will adjust to and find a way to love every second of. But, nothing will ever, ever compare to Savasi island. If the opportunity ever arises in your life and the desire for a more unspoiled, authentic island experience beckons…I cannot recommend it enough. Pack one bag. Gotta go, the pig is ready.